It’s something you eat not necessarily because you want to, but because you want to say you did. But I’ve eaten plenty of salads. I love salads...provided it has things in it that can be loved. My favorite salad is the Indonesian dish gado gado, which is technically called a salad but has tofu, hard boiled eggs, and a peanut sauce that can make anything it touches edible. In fact, there are a lot of Indonesian dishes that are technically salads. It's just Indonesians don't have a word for salad. Salad is food. Food is salad. My unproven hypothesis is that the word “salad” exists only in meat-centric societies that needs something to describe a food that contains mostly vegetable. 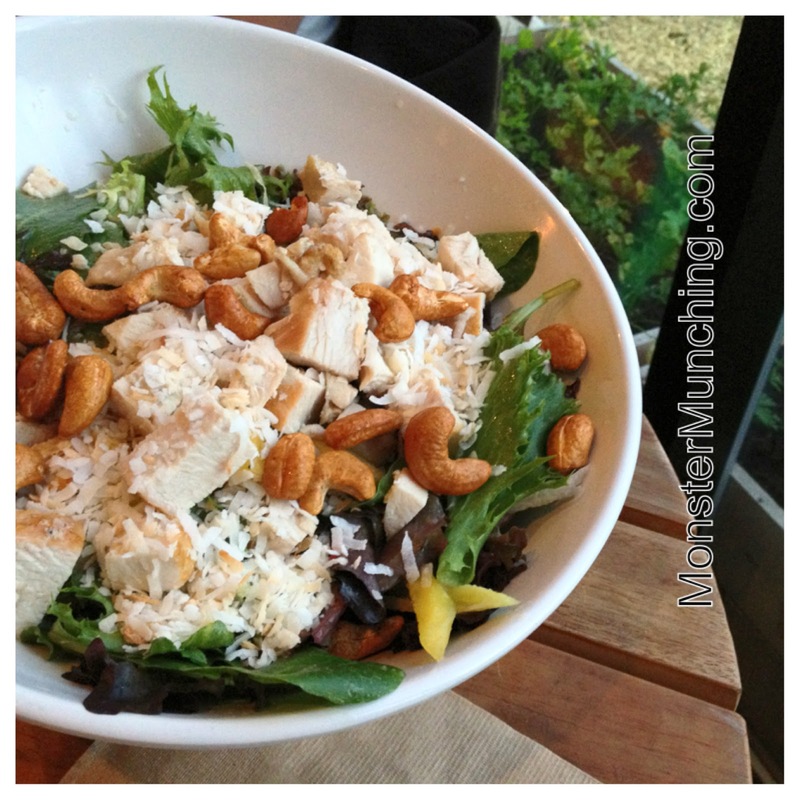 The lemongrass chicken salad I had recently at Greenleaf Gourmet Chopshop, which has made a name for itself in making salads, is another salad in a short list of Western World salads I’ve enjoyed. When I ate it I felt good about myself. Perhaps it’s because the restaurant is designed to make you feel good about yourself and your dietary decision to eat there. There’s a working garden outside and non-HFCS soda dispensed in the drink fountains. The place looks like a log cabin built by hipsters. The salad I ate has chicken, but it was beside the point. This salad would have been good without the chicken. What makes it a great is everything else, including the tender, delicate baby mixed greens, the mango, the grilled pineapple, the jicama, the toasted coconut, the cashews, and most of of all, the lychee vinaigrette that has hints of Thai chili, Thai basil and yes, the perfume of that magical herb, lemongrass. This is a salad that's more than a promissory note; it's a salad jackpot. There are two things you need to order at Van's Restaurants. First and foremost are the banh xeo. Van's is, without question, the reigning ruler of these crispy fried Vietnamese pancakes that can be best described as a cross between a French crepe and a Venezuelan arepa. You eat it with a bunch of herbs, sluice it with fish sauce, making little lettuce-wrapped burritos with the scraps of crispy fried batter and the oil-wilted bean sprouts and shrimp. The second thing you need to order is the banh tom. In fact, just order the banh xeo and banh tom. The two will make what I consider a very lovely lunch. Banh tom is deep-fried simplicity at its finest and most basic. They take sweet potato, lace it in a light tempura batter, then drop it in the oil with these thick, fat, juicy, gigantic whole shrimp. 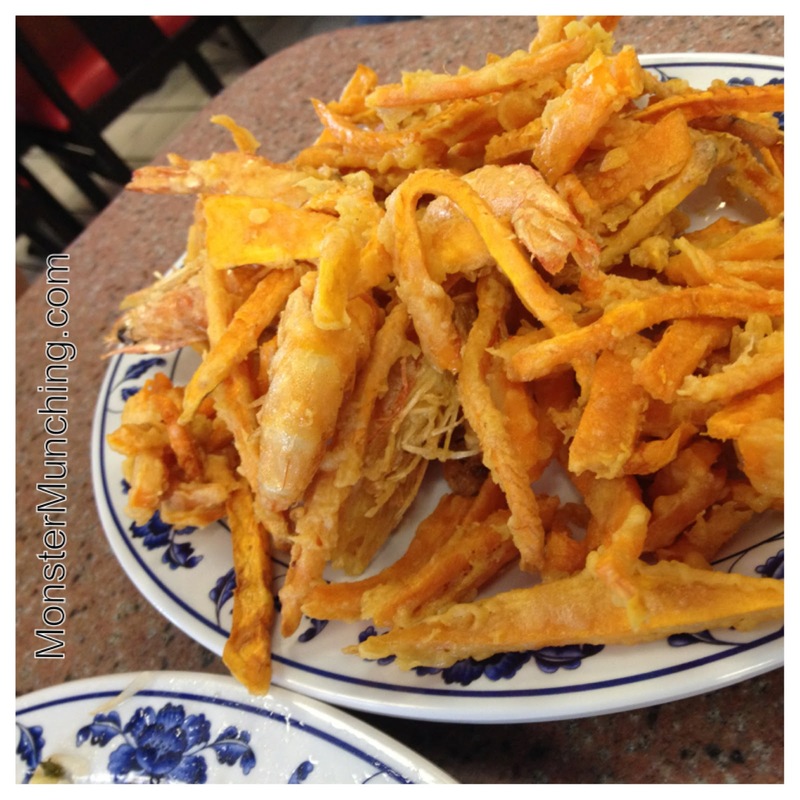 Traditionally, like at Brodard across the street, they are supposed to arrange the sweet potato sticks to form little rafts on which the shrimp rests. No such effort is made at Van’s. 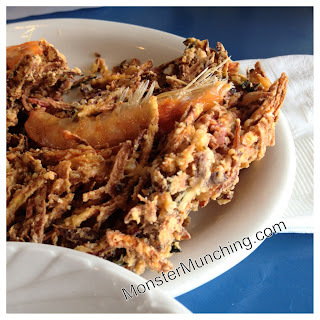 Van’s doesn’t do much more than throw a mess of the potatoes into the fryer and follow it with the shrimp somewhere in the middle. But somehow, Van’s banh tom is much better, crispier, sweeter, more delicate and more decadent than Brodard’s. Be prepared on how greasy the thing is. It straddles that fine line where you’d say it’s too oily but never goes over it. It’s perfect tangle of hot, fried food. You eat it the same way you eat the banh xeo: with fistfuls of herb and cold dunks into that ambrosial fish sauce. I should warn those who’ve never been to Van’s that this restaurant is old, well-worn and grimy. The floors seems to be perennially strewn with bits of food from the last group of customers who just finished their own banh xeo and banh tom feasts. There will be a few discarded stems and bits of torn napkin that may not have had a chance to be swept up. The overworked busboys simply can't keep up with the demand for tables and the ravenous appetites of those who come for the banh xeo and the banh tom. Yes, that is a Space Shuttle in the background. No, it's not a real Space Shuttle, but neither is the Viking ship parked in front of it. The Norse vessel is, in fact, the Viking Truck, a soldier itself in the army of luxe loncheras that has invaded Orange County the past couple of years. But the irony was too delicious for me not to snap a pic, and also, order a corn dog. 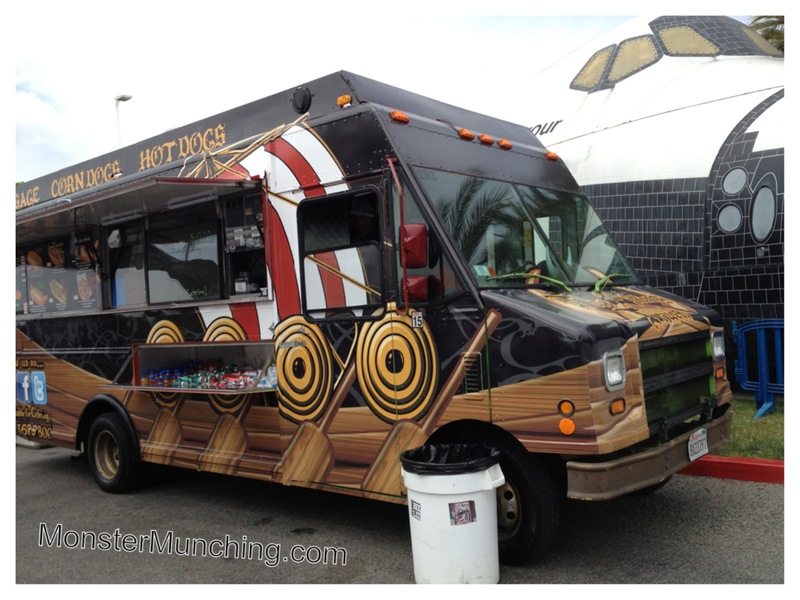 Years ago, when this food truck craze was just in its infancy, I wrote somewhere that I wished the Disneyland Corn Dog Truck (you know, the one at the end of Main Street) would break free of its moorings and do a victory lap around Orange County. It offered what’s not only the most affordable and the best thing to eat in the Magic Kingdom, but also the most wonderfule corn dogs this side of the OC Fair. Well, that’s never going to happen. I’ve seen the Little Red Wagon move. It creeps along at a snail’s pace as if it were stuck on half a gear. And I’m pretty sure the DMV does not consider it street legal. That’s where The Viking Truck comes in. 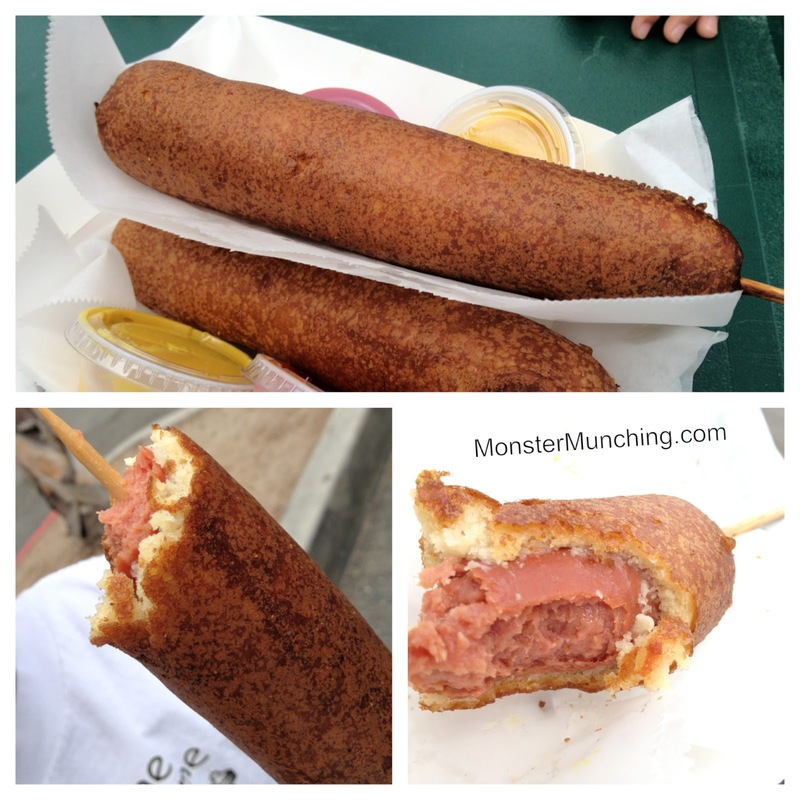 It serves corn dogs, freshly dipped gigantic ones about the size as Disneyland's. I’ve not done a side-by-side comparison, but I like these just as much. The batter isn’t as thick, nor are they lopsided and malformed like a petrified amoeba--one of the best qualities of a Disney corn dog--but it is more delicate, and slightly creamier also. The Viking Truck’s batter actually melts after you breach the outer crust. And the wiener beneath is thicker, a better tasting dog than I presume Disneyland now uses (they reportedly changed it to a “healthier” pork-and-chicken blend of some kind). And there’s this fact: a picture of the Little Red Wagon with Tomorrowland in the background isn’t nearly as anachronistic. If you like Filipino food and happen to find yourself in Vegas, get thee off the strip and locate Goldilocks on your Google Maps app, stat! You won't regret it. Filipino food, which is surprisingly plentiful in Sin City, is still unappreciated by non-Pinoys even in this increasingly metropolitan town in the middle of the desert; but this, from what I can tell, is where the local Filipinos go when they want a good, bountiful pot of sinigang, thick kare kare, and binagoongan fried rice. You might be dismissing my recommendation right about now, thinking that you've been to the Cerritos Goldilocks and that it wasn't "all that" compared to Magic Wok. But the Vegas Goldilocks operate their kitchens their own way, answering to no one but their own high standards. It may be in the same Goldilocks family, but the cooking here is as different from the Cerritos branch as your mom's compared to your aunt's. We ordered a bowl of sinigang and it was one of the finest I've sipped in a long time, with mustard greens, actual pork spare ribs, and pieces of okra that slowly thickened the broth. 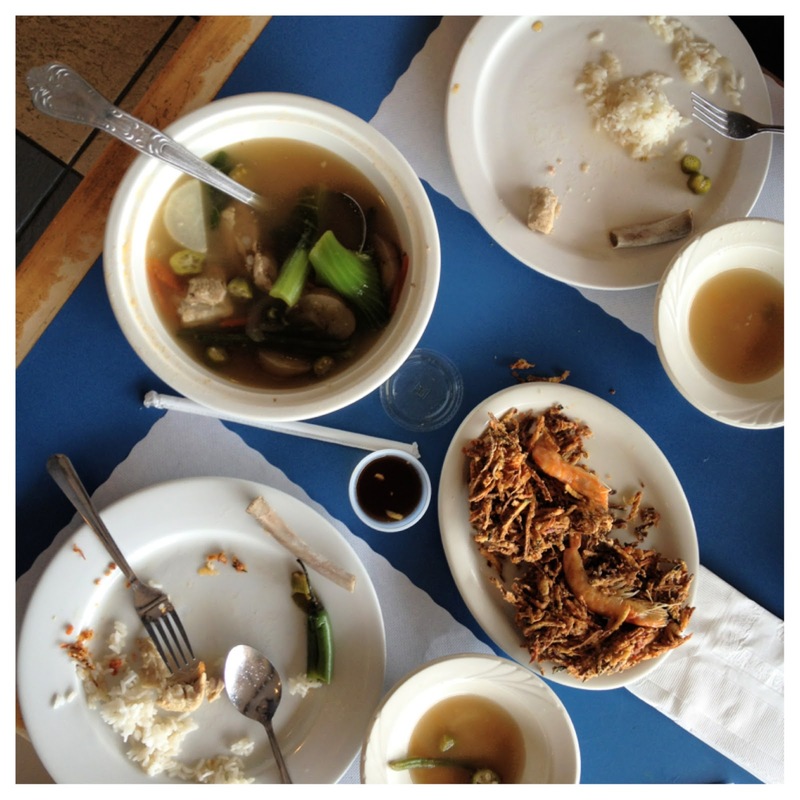 And as always when we go to this Goldilocks, we ordered the ukoy, a fried nest of shredded yams, zucchini and carrots rendered crispy and greaseless with a whole shrimp stuck to it and a sour-sweet-soy dipping sauce you use to douse.